"[T]his is what I call the Frankenfood Paradox. Transgenic modification in the lab is the least invasive genetically, it is the most well understood, yet it is the one most shunned by those that oppose biotech. "With genetic engineering, scientists can breach species barriers set up by nature. For example, they have spliced fish genes into tomatoes. The results are plants (or animals) with traits that would be virtually impossible to obtain with natural processes, such as crossbreeding or grafting. 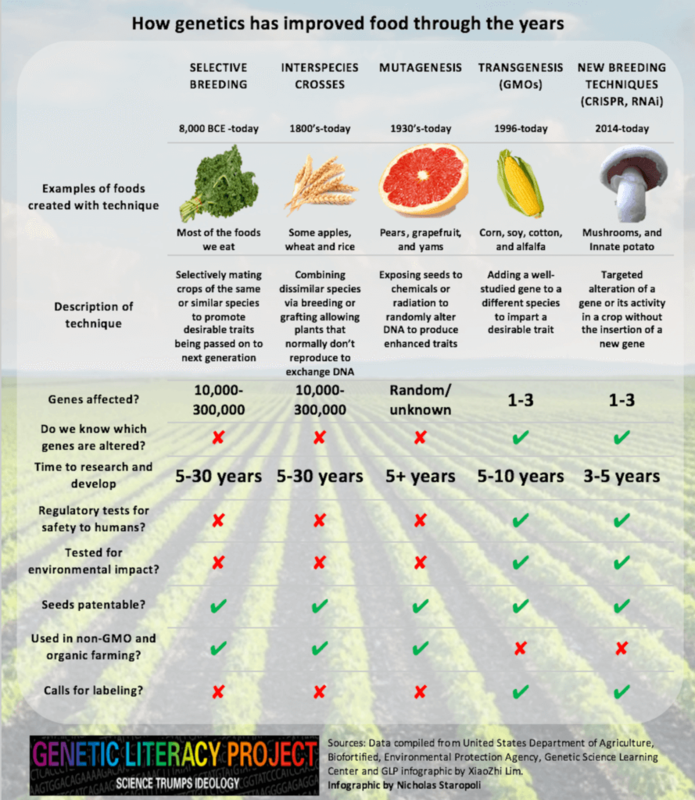 When GMOs came onto the market in 1996, the conventional wisdom was that these new plants and foods were fundamentally different from more traditional varieties because each contained a “foreign” gene—one not found “naturally” in that plant, and often from an unrelated species. That’s what scientists call transgenics. 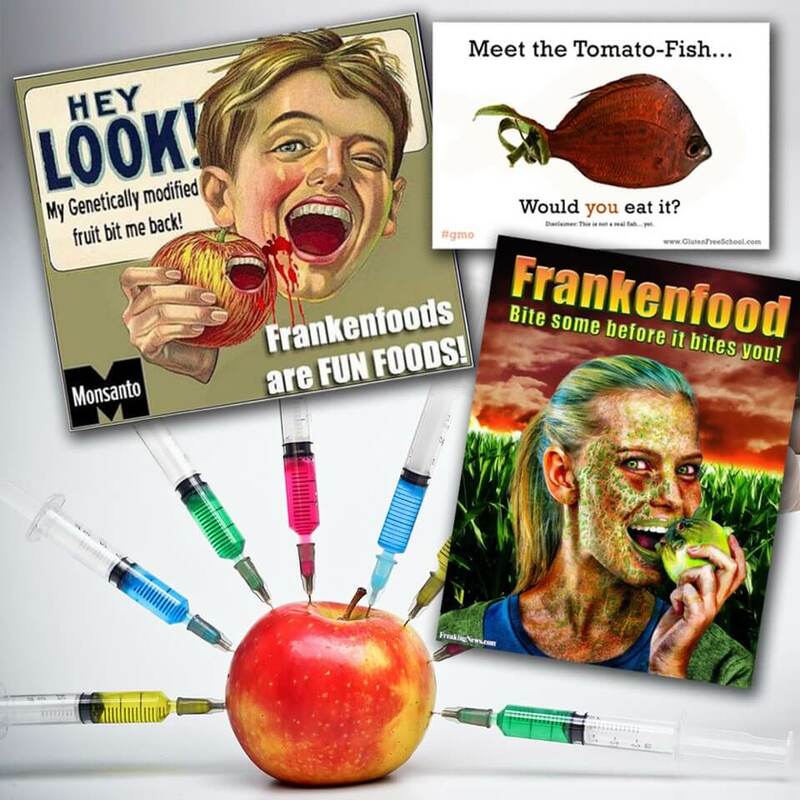 It’s also what spurred the invention of the derogatory activist term, “Frankenfood,” which is often accompanied by scare pictures caricaturing the process. Anti-GMO activists claim the moving of genes between species could upset the balance of nature or cause new allergens. Scientists see it differently. In most ways, breeding using genetic engineering is fundamentally similar to those used for thousands of years—by nature and humans. In selective breeding, the plants’ natural ways of reproduction are turned to human ends. Before we knew what DNA was, humans were moving the genes we found useful into our best crops. For more than 80 years, breeders have routinely used radiation or chemicals on seeds to scramble plant DNA to generate new traits, a process known as mutagenesis. “Wide cross” hybridization has given rise to plants that do not exist in nature. All of these are unregulated and foods grown from these plants can be sold as organic. Since the development of the science of genetics, we have become even more precise in manipulating the DNA of plants to refine the breeding process. 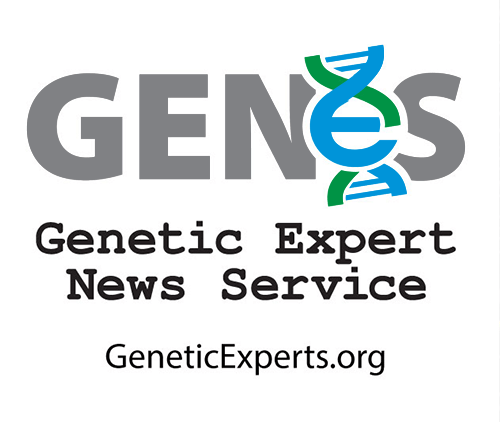 More recently, scientists pioneered gene editing and forms of cisgenesis —making genetic changes using the plant’s own genes or genes from the same species. Although cisgenesis does not involve the transfer of foreign genes, critics of biotechnology claim it still violates the ‘natural order’ and poses unknown risks, and are demanding gene edited crops be regulated as GMOs. Scientists challenge the concept of “foreign genes.” Humans have dinosaur genes and genes from every species on earth in our DNA. Humans and bananas share around half their DNA; that doesn’t make humans “half banana” – nor does it make those shared genes “banana genes.” They are just genes and they are useful to bananas and humans in different ways. While humans and nematodes and dogs and birds share genes, they express themselves differently. That’s why scientists are uncomfortable with the term “foreign genes”— it’s scientifically meaningless. Early ancestors of several modern food staples. Most plant scientists view transgenesis — moving genes between unrelated organisms —as just another step in the 10,000-year history of evolution and human-guided plant breeding. Nature does it naturally. Sweet potatoes were modified at least 8,000 years ago when bacteria inserted its DNA into the wild ancestors of today’s vegetable, conferring its sweeter, more edible flavor. 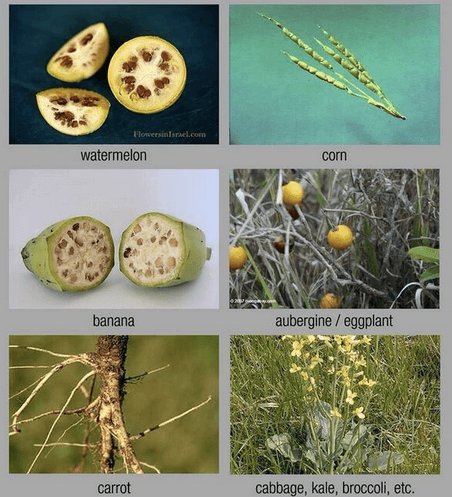 Farmers have been accidentally making GMOs for millennia by grafting plants, such as a tree that bears delicious fruit with one that has disease-resistant roots. Cells on either side of a graft swapped the entire nuclease of a cell, energy-generating mitochondria and chloroplasts – organelles that carry out photosynthesis and have their own small genome. “It’s genetic engineering done by mother nature,” said Ralph Bock of the Max Planck Institute of Molecular Plant Physiology in Potsdam, Germany. Modern forms of genetic engineering, most scientists say, are a more precise way to add desirable or subtract undesirable traits. Throughout history, breeders have manipulated plant development through sexual crossing. Almost all the foods we eat today are not “natural”—they have been modified, or in some cases created from almost inedible wild plants. Conventional breeding and genetic engineering do not describe single techniques. 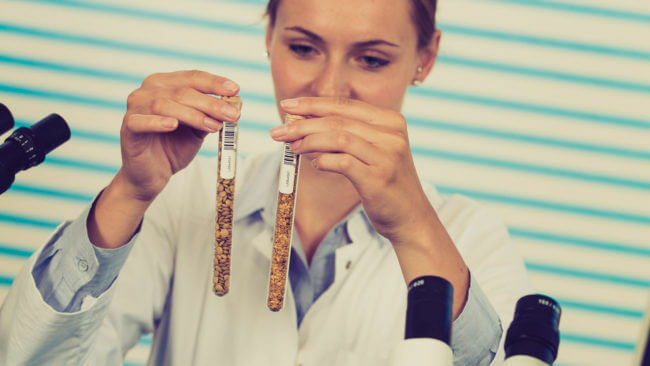 Instead, they encompass a spectrum of breeding methods used to achieve the same goal: the modification of a plant’s genetics to create something that tastes better, has stronger pest resistance, is more nutritious, etc. Breeders employ a wide range of techniques in the development and refinement of plants and animals. Interspecies crosses, also known as hybrids, have been occurring since the 19th century. The result is the mixing, through sexual reproduction of two animals or plants of different breeds, varieties, species or genera that would never mate in nature (although some natural hybrids have occurred). Modern and ancient forms of wheat, peppermint and a tangelo are examples. Polyploidy, which is chemically induced hybridization, increases the amount of genetic material in a plant to do things like increase fruit size or improve fertility. Examples are seedless watermelon and kiwi fruit. Protoplast fusion is a technique in which plant cells are fused, often using an electric field, to move beneficial traits from one species to another. Mutagenesis, developed in the 1930s and still used today as an “acceptable” alternative to genetic engineering,” involves radiating or chemically dousing seeds in laboratories to create thousands of unknown random mutations in the hopes of finding beneficial traits. More than 3,000 plants have been produced this way, including the sweet Ruby and Rio Red grapefruits (irradiated with thermal neutrons), versions of durum wheat used in premium Italian pasta, Calrose Rice and the Oso pear. Although all of the above listed techniques have been used by farmers and scientists to create fruits, vegetables and other plants that were not found in “nature,” they are all considered “conventional” and undergo no special safety or allergen tests. The food products of these random gene alterations can be sold as organic despite their “unnatural” origins. Genetic engineering emerged in the 1970s and 1980s. Molecular techniques were developed to move precisely target individual genes in plants rather than rely on scattershot techniques like mutagenesis. Scientists considered it the next-step evolution in gene breeding but many advocacy groups did not. Despite the fact that transgenesis was more precise than conventional breeding, it was subjected to intense regulatory review. Transgenesis, usually using agrobacterium-mediated transformation, is the most common form of genetic engineering. It uses a harmless bacterium and has the ability to transfer a portion of its DNA, carrying a new desirable trait on its back, into a plant’s DNA. This technique was used to develop the overwhelming majority of GMO drugs, such as insulin, used safety (and uncontroversially) for decades,as ell as crops including herbicide tolerant and insect resistant varieties. RNA interference (RNAi) techniques allow scientists to switch off specific genes within the plant itself—a form of cisgenesis (which does not involve mixing of species)—to eliminate undesirable traits. Recombinant DNA techniques allow them to insert genes to add desired traits. The Arctic Apple and Innate potato whose genes for browning were silenced, are products of RNAi technology, and are not regulated as GMOs. CRISPR/Cas9 and other gene editing techniques are the newest, most precise forms of genetic modification. These allow researchers to move around or delete targeted regions of a genome and introduce variations, to develop crops or animals with desired traits. There is a great deal of regulatory uncertainty over genome editing—critics of GMOs are pushing to have cisgenic breeding regulated in the same way as traditional transgenic crops. Several products, including a mushroom that resists browning, have escaped the scrutiny of the USDA, which has ruled that it doesn’t need to approve new varieties created without the use of foreign DNA. However, products designed as food for humans are still reviewed by the Food and Drug Administration. In many — if not most — ways, there is little practical difference between conventional breeding, genetic engineering and gene editing. The variety of methods used by these various approaches share many similarities when it comes to outcome potentials. All three approaches bring with them a certain randomness. Critics of genetic engineering spend a lot of time focused on the potential for unintended consequences of humans redesigning the genetic material of a particular plant. But this is characteristic of virtually every technique used by breeders, whether conventional or genetic. There have been instances, for example of conventional breeding resulting in crops that are toxic to humans. Those include the Lenape potato and the organic “killer zucchini”.